On September 17, 1912, Vesto Melvin Slipher exposed the first plate on which he would later measure the first radial velocity of a "spiral nebula" -- the Andromeda Galaxy. Using the 24-inch telescope at Lowell Observatory he followed up with more Doppler shifts, and established that large velocities, usually in recession, are a general property of the spiral nebulae. Those early redshifts measured by Slipher were not only recognized as remarkable by the community, but were later critical to the discovery of what eventually came to be called "The Expanding Universe." Surprisingly, Slipher's role in the story and that of many other important contributors remains unknown to much of the astronomical community. To commemorate the 100th anniversary of the first measured Doppler shift in the spectrum of a spiral nebula, a conference was held September 13-15, 2012 in Flagstaff, Arizona, home of the Lowell Observatory. 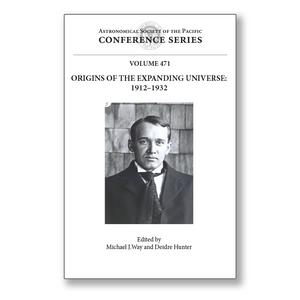 This conference brought together astronomers, historians, and interested lay people to explore the beginning and trajectory of the concept of the expanding universe.